Massive Price Reduction from K-Source Mirrors - hurry up and act now! Get a back-up camera system by K-Source, and you'll never be a cause of trouble on the driveway or a parking lot. It includes a mirror with the integrated color LED screen, video installation cable, and a high-performance reverse CCD camera. The monitor will appear right in your rearview mirror and you will be able to clearly view that blind spot right behind your vehicle. When the camera is not in use, the monitor will disappear allowing you to use a regular rearview mirror. The camera mounts on the license plate. The VS8 comes with a high performance, water tight reverse CCD camera, mirror with built-in crystal clear 3 1/2 in. color LED monitor and video installation cable. This camera is the easiest and the most efficient way to add safety to your Honda Accord and safety of those around. Only now you have a great chance to become an owner of this camera and save on purchase! 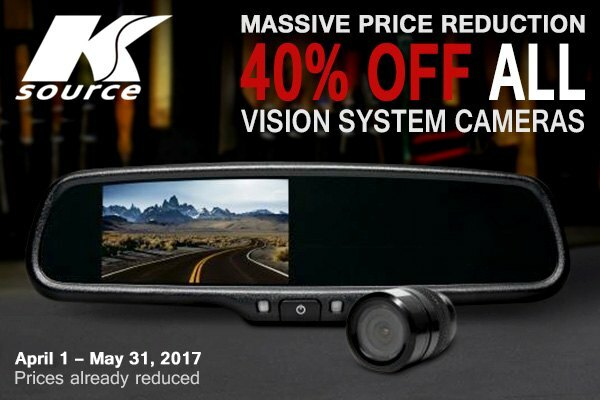 Buy high quality K Sourse Vision System Camera and SAVE 40% OFF the original price. Hurry, sale prices won't last long so buy yours now! This offer is valid through May 31, 2017. PM me today for a quote or leave your inquiries below. Last edited by carid; 04-05-2017 at 07:34 AM. 94-97 accord mirrors swap 96-00 mirrors? Quick Reply: Massive Price Reduction from K-Source Mirrors - hurry up and act now!